(FIAPBT). (Last revision 2Th April 2009). All standards created for any animal species, have a basis weight when they were developed. In any animal species you can come across with different standards, which were created by experts for each particular species, for example : Racehorses have a suitable standard to set an ideal functionality in these animals, this way, you can approximate as much as possible in their morphology to be the suitable one in order to fulfill their mission, which is to run faster than other breeds of racehorses. The same thing happens with any other animal species that humans entrust any kind of task; this way , we will have to create necessarily the standards to make them be the best, in the different disciplines that humans assign the animal species to be. For this reason, American Pit Bull Terriers being the working breed dogs par excellence, those breeders who consider themselves professionals of the breed, should breed APBT samples which were in the official standard of American Dog Breeders Association (ADBA) or in the International Federation of the APBT (FIAPBT).Samples which are in the official standard, will have a guaranteed functionality to develop any kind of job, since the offical standard of the APBT is designed to get the best performance working in any kind of job, however strange it may seem and always to benefit the humankind.These extraordinary performances, are also movable why not, to canine sports. HEAD: an exaggerated head, will simply make it bear an excessive weight which undermines its functionality at the time of performing a work. 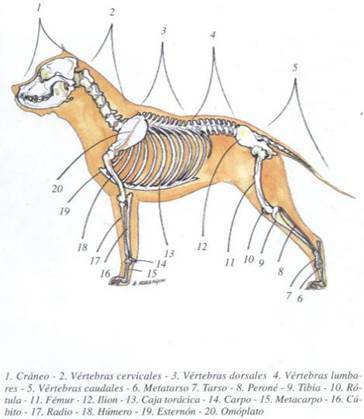 An APBT for any purpose with a well-proportioned head, must look the two thirds its shoulder width, and be a 25% wider in its cheeks than in the neck to the base of the skull. From the back of the skull to the stop, it must be the same distance as from the stop to the tip of the nose.The snout must be straight and square–shaped. The depth from the top of the head to the lowest part of tha jaw is important. The jaw is closed by the muscle of the temporal fossa, making the pressure the animal needs over the coronoid process. The head will be wedge-shaped when viewed from top or from side, when it is viewed from the front it is round. Dogs with excessive lips are not accepted. EYES: The eyes are round, separated and situated in a low position.All colours are admitted and uneven eyes (eyes with different colours in the same amimal ). TEETH: scissors closure, pliers closure and inverse scissors closure are admitted, never enogmathism. The inverse scissors closure or “prognathism”, even though it is the most effective teeth closure to perform the prey work, mustn’t be neither excessive nor caused by the displacement of the jawbones, because if so, it will be considered as a fault. Of the three admitted closure, the most effective to develop the work of the prey, is the inverse scissors closure or even with a small separation between the teeth of above with respect to those of down. NECK: The neck must be strongly muscular to the base of the skull. BACK TRAIN: This is the driving train of any four-legged animal. An 80% of an APBT work is developed in its hips and back legs. A long and lean hip is extremely important, because it will provide a better support point to the femur, and this one must be shorter than the shinbone. The hip must be wide. Being like this, it will involve a wide lumbar area, allowing this way a wide surface for the insertion of the gluteus muscles and the femoral biceps, which are the biggest motors in the driving train. FRONT: The dog will have to own deep ribs. They are wide at the top, narrowing to the low part.The ribs house the lungs, which are not tanks but pumps.The ribs act as a bellows. Their effectiveness is related in the difference between the contraction and expansion volume. The ribs depth involves more room for the lungs to be bigger. The shoulders will have to be a bit wider than the ribs at the level of the eighth rib. Too narrow shoulders won’t support a suitable muscular structure, but at the same time a too wide shoulder structure, makes the animal slower and adds it too much unnecessary weight. The shoulder blade must be situated at 45 degrees, or something less, of angle to the ground, and this will be wide and flat. The elbows must settle flat, with the humerus in an almost parallel trajectory to the spine. The elbow must reach below the ribs. The forearm must be only a bit longer than the humerus and this one must be thick and solid, almost twice the thickness of the metatarsals, at the level of the hock. The front legs and shoulders must be able to support a lot of work and their thickness can become a power at this point. The feet, must be small and high inserted in the pasterns. TAIL: The tail will be low inserted; it will be long until a little before reaching the hocks. This one, has a thick base narrowing to the end. It must crank-shaped when the dog is relaxed. MANTLE: The mantle can be any colour or combination of them, with the exception of the merle colour. It must be short and strong. The shine of the mantle usually reflects the health of the APBT, a vital sign. SKIN: It must be thick and loose, but without folds, with the exception of the neck and the chest, which must be loose enough to show some vertical folds. WITHERS HEIGTH: The withers heigth in males can vary from 38 cm to 48 cm, and in the females; from 35 cm to 45 cm. WEIGHT: In spite of many people’s belief, APBT is a small breed dog, at most medium-sized, finding the weight of the males that can vary from 13 kg to 27 kg; and in females from 12 kg to 23 kg. Someone might have a pure APBT specimen that weighs three or four kg over these weghts, but surely it would have to be fat. GENERAL APPEARANCE: The APBT will have to be square-shaped viewed from side, the distance from the shoulder to the hip point must be the same distance from the shoulder to the ground.The animal will tread high and it will have a maximum point of support for its body weight. The American Pit Bull Terrier is a complete athlete. Its morphology is developoed for speed, power, agility and force. It will have to be balanced in all directions, too much of something steals another thing, at the moment of performing any kind of work. The selection of American Pit Bull Terrier breeding, at combining The standard (functionability) with its heart (balance, intelligence, courage, determination, bravery and nobility), the result is unbeatable, discovering the best breed dog to perform all kind of works and sports, however adverse the circumstances are at the time of executing them. AMERICAN PIT BULL TERRIER BIG, Yes or not? Before clearing up this question, we want to offer some existing data in Spain to the amateurs to this great breed dog, that at the same time they are done extensibles in any another country. If to count us to all those dogs located in Spain, that their owners affirm to be American Pit Bull Terrier, we would arrive at the figure of 450.000, since the FIAPBT we assure that the A. P. B. T. of pure breed in Spain, because if not they are of pure breed not they are A.P.B.T., no more than 3000. In this aspect, we have to tell that hundreds they exist of breeders opportunists that alone worries to gain easy money, deceiving to the unskilled and selling them dogs of other breed dogs or crossbreed, like American Pit Bull Terrier of pure breed. 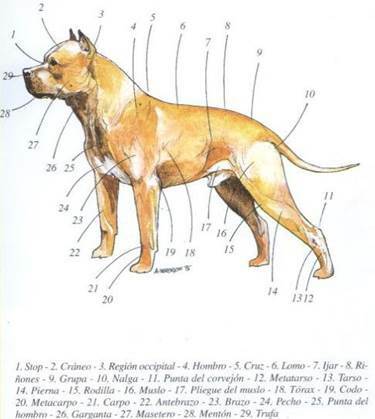 Centering us in the question of this section we have to tell that the breed dog American Pit Bull Terrier, since was created like breed dog 500 years ago, were always small dogs or to medium the most greatest thing, since being of these characteristics, was gained greater funcionality for the job. Of fact, the best A. P. B. T. of all old and modern times, weighed 20´900 Kg., we refer to Tudor´s “Dibo”. We pass to expose the opinions upon this matter, of three experienced enthusiastic to the American Pit Bull Terrier, the first one of them is our President of the International Federation Mr. Mariano Peinado. - - Mariano Peinado , international A. P. B. T. Federation President. In the first place, meant that master to the breed dog American Pit Bull Terrier, they be of an or another ramification genética, of a color or another, of any physical structure, or of any weight, whenever they be of pure breed and they be inside the standard and of course, accrediting its pedigree official, which, is the only document that certifies the purity of breed. Not it wanted that him me badly they interpreted my words, therefore also master to all the dogs of breed or crossbreed and to all the animal species, the ones that know me they know it very well. It is of vital importance, that all the ones that are involved in the breeding of this breed dog, we continue conserving to the A. P. B. T. as what always to been, a functional dog for the job, stable and every heart, with a power weight combination astonishing, without keep in mind at all the esthetics or beauty in the selection. In this manner we will obtain that the pure breed not itself extinguish, and he follow being the best breed dog to develop any type of job, maintaining in its typical heart virtues as the nobility, valour, throw, tenacity, caste, vigour, and the astonishing endure so characteristic physicist of them. When a A. P. B. T. this in the 25kg. or 27Kg., this classified as a A. P. B. T. big, but when the supposed A. P. B. T. exceed these weights, these they lose enough funcionality for the job, therefore they were tired enough more by have to bear an excessive weight, that is not typical of the pure breed. From there the importance of not enlarging the full-size in the A.P.B.T., therefore if the ones that we raise him we did him, he autentic A. P. B. T. would be extinguished and he would be born a new breed dog, thing that the ones that really love to the American Pit Bull Terrier never we wanted. The A. P. B. T. is a breed dog that him to fashionable position in many countries, and can assure that the fashions do not bring anything good. The fashion contracts demand, and the breeders opportunists demand, which, they know very well about the ignorance of the persons that begin in the race, being for them an easy prey to deceive. These breeders opportunists, not they are bothered in acquiring good dogs of the race, simply they cross some dogs with other, and including, dogs of other breed dogs that the fisic are similar to the A. P. B. T. and they sell them as A. P. B. T. pure, and the truth is that they sell them very well, on the one hand by the ignorance of the persons that begin, and by another side upon being dogs of weight, they do that be dogs very beauty with a great deal of head and a great deal of body, with an esthetics very beauty but with very little funcionality in comparison to the A. P. B. T. of pure breed. This type of dogs to which they call A.P.B.T., are the most attractive for the persons that begin in this breed dog by their beauty, thing that the breeders opportunists know very well and therefore same they perform this type of deceits. In conclusion to the question from A. P. B. T. Big, yes or not?, of course that not. - - Mar Bartolomé, Breeder of American Pit Bull Terrier. The American Pit Bull Terrier native is of a medium stature, of a weight whose stocking is of 19 Kg. With it it has been maintained a funcionality, agility and power better by no other breed dog. At present, and each time more, tries to do a A. P. B. T. of greater stature and with greater corpulence, but with all it they are being lost all the functional values of the American Pit Bull Terrier, and for which really admires it itself. If it is followed enlarging to the American Pit Bull Terrier, they can fall in the error of creating another new breed dog, without have nothing to do with the A. P. B. T. native, for which I create that to should think very seriously if we want an American Pit Bull Terrier or another breed dog new. In individual, I will follow raising the fisic from the A. P. B. T. native because thus I helped to maintain to the A. P. B. T. of some way as really is. On the other hand, nowadays they are being crossed A. P. B. T. With other races seemed physically, and the result is a heavy and large dog, but the reality is that is not a A. P. B. T., is a crossbreed of “full-size”. Not we degenerate the race and we follow maintaining a race in danger of extinction by the very much present crossings, by the “well economic” of some that they are called to itself same lovers of the race, when in reality are lovers of the money. - - Jorge Solé, expert in the race and trainer from A. P. B. T.
It forces, velocity, agility and above all, an incredible relation weight-power. If a supposed one American Pit Bull Terrier of 40 Kg. (Moloso) is capable of maintaining these characteristics, perhaps they are perfecting the race, but if is not thus, will be degenerate, what would degenerating it consequences irreversibles for the so dear one by us, he autentic American Pit Bull Terrier. 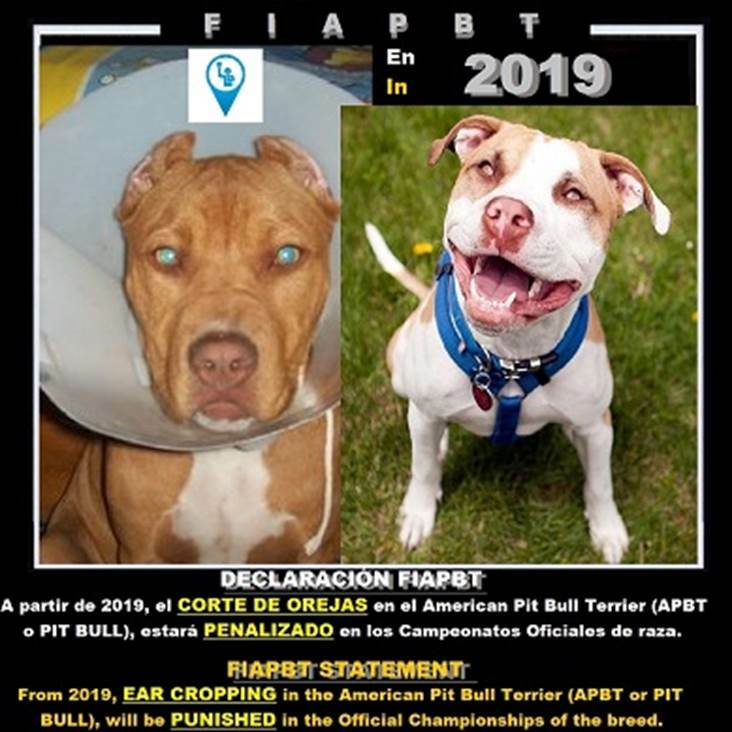 In April 2019, in the FIAPBT we will be doing the next standard REVISION of the breed, where there will be some UPDATES, which we can anticipate for example, the EAR CROPPING will be PENALIZED in the Show CONFORMATIONS.